For the bridge in central Moscow, see Krymsky Bridge. Having been considered at least since 1903, planning for the bridge began in 2014, after the Russian annexation of Crimea. In January 2015, the multibillion-dollar contract for the construction of the bridge was awarded to Arkady Rotenberg's Stroygazmontazh. Construction of the bridge commenced in May 2015; the road bridge was opened on 16 May 2018 while the completion of the rail link is scheduled for 2019. The bridge was christened the Crimean Bridge after an online vote in December 2017, while "Kerch Bridge" and "Reunification Bridge" were the second and third most popular choices. Following successful construction of the Indo-European Telegraph by the British government, a railway route from Britain to India through Crimea and across Kerch Strait was considered in the 1870s, but deemed too expensive.. In 1903 Tsar Nicholas II considered the idea again, but dismissed it because of the Russo-Japanese War and then World War I shortly after. The idea of this bridge was first conceived by Albert Speer in early 1943. He hoped that the bridge would help spearhead the German invasion of the North Caucasus, but history ruled that it would help the Wehrmacht to retreat: from January to October 1943 the retreat of the German Caucasus Army/Army Group A, took place across the Strait of Kerch. To support the retreat the German Organisation Todt (OT) had built a ropeway across the Kerch Strait with a daily capacity of 1,000 tons. On 7 March 1943 Hitler ordered the construction of a combined road and railway bridge over the Strait of Kerch within 6 months. Construction began in April 1943, but before it was completed, in September 1943, concentrated Soviet attacks began on the remnants of the bridgehead, accelerating the German retreat. As part of the German retreat, the Wehrmacht blasted the already completed parts of the bridge. A 4.5-kilometre (2.8 mi) railroad bridge was built in mid-1944, after the liberation of the Crimea by the Red Army, using the materials left on the site by the Wehrmacht. The bridge was built at the site of the current ferry crossing. It was never supposed to be permanent, and was destroyed within four months by flowing ice, due to the lack of groynes. Since 1944, various bridge projects to span the strait were proposed or attempted. Since the mid-1960s the Kerch hydrounit project («Керченский гидроузел») was developed. It was a proposed system of dams and bridges across the strait. The project was not implemented in connection with the collapse of the USSR. The idea of a Kerch Strait bridge resurfaced after the dissolution of the Soviet Union, but in 1994 the Russian and Ukrainian sides failed to finalize the project. Former Moscow mayor Yuri Luzhkov was a vocal advocate for a highway bridge across the strait, expressing hope that it would bring the Crimeans closer to Russia, both economically and symbolically. In 2010, Ukrainian President Viktor Yanukovych and Russian President Dmitry Medvedev signed an agreement to build a bridge across the Kerch Strait. Russia and Ukraine signed a memorandum of mutual understanding on the construction of the bridge on 26 November 2010. The rejection of the Ukraine–European Union Association Agreement in November 2013 led to increased interest in the construction of a bridge between Crimea and the Taman Peninsula of Russia. In late January 2014, the Ukrainian and Russian governments decided that a new joint Ukrainian-Russian company would be commissioned to handle the construction of the bridge, while the Russian state enterprise Russian Highways (Avtodor) would become responsible for the bridge in the long term. Additionally, it was decided a special working group would determine the location and set the technical parameters. Construction was estimated by the Ministry of Economic Development and Trade of Ukraine to take five years with a cost between $1.5 and $3 billion. In early February 2014, Russian Highways (Avtodor) was instructed by the First Deputy Prime Minister of Russia to work on a feasibility study to be published in 2015. Following the annexation of Crimea by the Russian Federation in March 2014 amid the deterioration of the Ukraine-Russia relationship, president Vladimir Putin announced that Russia would build a road-rail bridge over the strait, and prime minister Dmitry Medvedev signed a governmental decree to create a subsidiary of Avtodor to oversee the project. In April, the Ukrainian government gave Russia six months notice of its withdrawal from the now-defunct bilateral Kerch Bridge agreement. The Ukrainian think tank 'Center for Army, Conversion and Disarmament Studies' believed that the bridge could reduce shipping to and from Ukrainian ports on the shores of Sea of Azov by 25-30%. In January 2015, the contract for the construction of the bridge was awarded to the SGM Group, whose owner Arkady Rotenberg is reportedly a close personal friend of Putin and was internationally sanctioned in response to the Russian military involvement in Ukraine. SGM typically constructs pipelines and had no experience building bridges, according to BBC News. In May 2018, Ukrainian Verkhovna Rada Deputy Ihor Mosiychuk called upon the Ukrainian authorities to destroy the Crimean Bridge, a move seen as inciting terrorism. In November 2018 the area near the bridge became the location of the Kerch Strait incident, in which the Russian navy claimed that three Ukrainian vessels entered Russian territorial waters. Russian forces seized the vessels and arrested their crew. During this time passage through the Strait under the bridge was blocked by a tanker. In response, Ukraine declared martial law in some regions of the country for 30 days. The Russian government's draft resolution of 1 September 2014 required the bridge to have 4 lanes of vehicle traffic and a double-track railway. An official video from October 2015 contained a CGI concept of the bridge design, annotated with various measurements. It showed a four-lane, flat deck highway bridge running parallel with the separate two-track railway. The main span over the Kerch Strait shipping canal has a steel arch support, 227 m (745 ft) wide with a 35 m (115 ft) clearance above the water to allow for ships to pass under. There are three segments: from the Taman Peninsula to Tuzla Spit is 7 km (4 mi); across Tuzla Island is 6.5 km (4.0 mi); and from Tuzla Island to the Crimean Peninsula is 5.5 km (3.4 mi) (19 km (12 mi) total). The bridge is being built by Stroygazmontazh Ltd (SGM), which has never built a major bridge before. Because of the risk of sanctions, no international insurance company has underwritten the potential $3 billion loss if the project goes wrong. So a small Crimean insurance company has underwritten it. The geology of the Kerch Strait is difficult: it has a tectonic fault, and the bedrock is covered by a 60 m (197 ft) layer of silt. About 70 mud volcanoes have been found in the area of the strait. More than 7,000 piles support the bridges; these piles have been driven up to 91 m (300 ft) beneath the water surface. Some of the piles are at an angle to make the structure more stable during earthquakes. Some experts have expressed doubts that the construction is durable, given the tectonic and sea current conditions in the strait. Construction on the bridge began in May 2015. Approximately 200 bombs and a few airplanes (including Ilyushin Il-2 and Curtiss P-40 Kittyhawk) from the World War II era were found in the area during pre-construction clearance. Three temporary bridges were built, to facilitate access (independent of weather and currents) for main construction. By October 2015, the first of the temporary bridges had been constructed, connecting Tuzla Island and Taman Peninsula. The two shipping canal arches (over the Kerch–Yenikale Canal) were lifted into position in August and October 2017. In October 2017, National Guard of Russia Director Viktor Zolotov announced a new "maritime brigade" is being formed as part of Russia's Southern Military District to protect the bridge. On 15 May 2018, Putin led a convoy of trucks, driving one himself, across the bridge in an inauguration ceremony. The bridge was opened for vehicle traffic on 16 May 2018. In October 2018, the Russian Taman Road Administration reported that when one of the railway spans was being lowered into place, it tilted and fell into the sea. This occurred in the sea section between Tuzlinsky Split and Tuzlinsky Island. Ukraine has two major ports on the Sea of Azov through which it exports steel and agricultural products. Ukraine has alleged that the bridge is being used by Russia as part of a creeping hybrid blockade of Ukrainian ports in the Azov Sea, and that Russian inspections of ships have risen sharply since the bridge opened in May 2018, some being forced to wait for three days before being allowed through. The main span of the bridge is 33 to 35 metres (108 to 115 ft) above sea level; many ships are too tall to pass safely under the bridge. The bulk carrier Copan (deadweight tonnage 17,777 tons) solved this problem by cutting off the top of her mast. On 26 October 2018 The Globe and Mail reported that the bridge had reduced Ukrainian shipping from its Sea of Azov ports by about 25%. During the Kerch Strait incident Russia temporarily placed a large cargo ship across the channel under the bridge, in order to prevent passage of other craft. The Crimean Bridge is the primary object of the federal program "Social-economic development of the Crimean Republic and the city of Sevastopol" with the main goal of increasing GDP per capita in Crimea, to make it equal to the average of Russia. This is an ambitious task, as Crimea used to be one of the poorest regions of Ukraine before the annexation, with wages 14% lower than the average of Ukraine. Taking the GDP per capita of Crimea in 2013 this relates to a yearly income of $2,952, with the stated aim of the Russian Federation being to increase the income to Russian average meaning $14,973, more than five times. Among other methods, the government of Russia proposes to solve this problem by increasing the availability of transportation to the peninsula. Putin emphasized that all aspects of the economic program are dependent on transportation: tourism, ship construction, chemical industry, agriculture. Before the commissioning of the bridge, because of the transport blockade imposed by Ukraine, the main routes to and from the Crimea were the Kerch-Taman ferry line and air transport. The capacity of the ferry line is limited, which led to long delays on crossing during the peak of the tourist season, as well as during storms in the Kerch Strait. So, the construction of a Crimean bridge could potentially increase visitor numbers from 6 million to 10 million. On 5 August 2018, as tourists poured in, the bridge had broken a single-day record for car traffic, with 32,000 vehicles crossing the span. In 2014, the Crimean Republic accounted for 13.4% of the total harvest of grapes in Russia, 3.8% - fruits and berries, 2.6% - vegetables, 1.2% - grains. Most of these products cannot be consumed by the population of Crimea and need efficient means of delivery to external consumers. Producers in the Crimea are relying on the Crimean bridge and the major grain terminals of the port of Taman, since despite sanctions against the Crimea, local producers are actively exporting agricultural products to foreign consumers. To circumvent the sanctions they would need to bring their products to the port outside of Crimea, so that vessels carrying the produce do not put themselves at risk. Despite very complex logistics, Crimean agriculture produced more than 500 thousand tonnes of grain and 32 tonnes of coriander in 2015. The majority of this produce went to India, Pakistan, and Bangladesh. Crimea exports a large amount of wine to regions of Russia. After entering the economic space of Russia, Crimean wine producers in 2014 occupied about 36% of the Russian market by ousting foreign manufacturers. Although this was largely accomplished through the abolition of customs barriers, logistical problems still prevent further growth. The largest producer of titanium dioxide in Europe — Crimean Titan, also relies on this bridge. The chemical giant itself now controls about 20% of the Russian market for basic raw materials for paints, so it also needs cheap means of delivering products to consumers in mainland Russia. Crimean Titan built 6 km of railroad in order to gain access to the Crimean bridge railway. Another strategic direction of the development of the economy of the Crimea is the development of shipbuilding and ship repair enterprises. There are a number of shipbuilding and ship repair enterprises in Crimea, the largest of which is Zaliv Shipyard then Shipyard "Morye" known for the construction of hovercraft for landing operations such as the Zubr, and Sevastopol SMZ. At the moment, the "Morye" is carrying out a major state order for the construction of the Karakurt corvettes for coastal operations of the Black Sea Fleet. The shipbuilding enterprises of the Crimea included in the United Shipbuilding Corporation are dependent on the delivery of large-scale equipment for vessels, such as engines and missile launchers, which are produced in mainland Russia and the necessary logistics for shipbuilders to provide the Crimean bridge. After the annexation of the Crimea, the Russian Federation took control of several ports with a total transshipment capacity of up to 20 million tons. Despite sanctions from the US and Ukraine, about 260 vessels continued their transportation to the ports of the Crimea. Further increase in traffic is impossible without a bridge, since the ultimate distination of many cargoes is Russia. In particular, grain terminals of the Crimean ports are of great interest for Russian companies. Although most of the Crimean ports are small, transport with the participation of small vessels such as the Volga-Don class is of great value. The Crimean bridge, due to the connection of the ports of the Crimea to the road and rail network allows more effective use of this property. The largest port of Crimea with transshipment of almost 10 million tons is the Kerch seaport, which directly adjoins the Crimean Bridge. In 2017, it was reconstructed with the creation of a new container terminal with transshipment of 110 thousand standard containers per year with a focus on river-sea river routes through the Caspian-Volga-Don canal. 1.2 billion rubles were invested in the reconstruction of the port from the federal budget. The Kerch Port will combine three ports into a single cluster; the Kerch Port, the Kavkaz Port, and the Taman port, all of which can serve a large railway sorting from the station of Portovaya. The other Crimea ports are redeveloped for passenger transportation along the southern coast of Crimea, mainly for tourist transportation. ^ If the border between Europe and Asia is drawn along the Kerch Strait, the Crimean Bridge is intercontinental and connects Europe and Asia. ^ "Началось возведение свайных фундаментов Керченского моста". 10 March 2016. ^ "Проектировщик моста в Крым — РБК: "Мы нашли оптимальное решение"". РБК. Retrieved 16 May 2018. ^ a b "О проекте". ^ "Строительство моста через Керченский пролив. Съемка с коптера". РИА Новости Крым. 22 May 2017. ^ a b c "Автодорожная часть Крымского моста открылась для движения автомобилей". ТАСС (in Russian). Retrieved 16 May 2018. ^ "Сколько будет стоить проезд по Крымскому мосту? - КерчьИНФО — новости Керчи". 12 May 2018. ^ Roth, Andrew (15 May 2018). "Putin opens 12-mile bridge between Crimea and Russian mainland". Retrieved 19 September 2018. ^ Stolyarov, Gleb. "Trucker Putin opens Russia bridge link with annexed Crimea". U.S. Retrieved 19 September 2018. ^ Walker, Shaun (31 August 2017). "Russia's bridge link with Crimea moves nearer to completion". Retrieved 19 September 2018. The bridge, which will be 12 miles long when complete, is due to open to road traffic next year and rail traffic in 2019. It is a major part of the Kremlin’s plan to integrate Crimea, seized from Ukraine in March 2014 in a rapid military operation. The international community still regards the territory as part of Ukraine, and Crimean officials and companies have been under western sanctions since the annexation. ^ CNN, Nathan Hodge,. "Russia's bridge to Crimea: A metaphor for the Putin era". CNN. Retrieved 19 September 2018. The United States and most other countries have refused to recognize the annexation of Crimea, and sanctions on Russia don't seem likely to be lifted anytime soon. ^ a b "Bridge connects Crimea to Russia, and Putin to a Tsarist dream". South China Morning Post. Retrieved 17 May 2018. ^ CNN, Nathan Hodge,. "Russia's bridge to Crimea: A metaphor for the Putin era". CNN. Retrieved 17 May 2018. ^ News, A. B. C. (15 May 2018). "Putin inaugurates bridge by driving a truck across to seized peninsula Crimea". ABC News. Retrieved 17 May 2018. ^ Avril, Pierre. "Crimée: le pont qui entérine l'annexion". Lefigaro. Retrieved 18 June 2018. ^ "Crimean bridge will open to car traffic in May, well ahead of schedule". RT International. 20 March 2018. Retrieved 10 April 2018. ^ "Голосование за название строящегося в Керченском проливе моста завершено". Interfax.ru (in Russian). 17 December 2017. Retrieved 17 May 2018. ^ "Мост жизни. К предистории Керченского моста". thehimki.ru. Retrieved 13 December 2017. ^ "История строительства и разрушения моста через Керченский пролив". www.rzd-expo.ru. Retrieved 17 May 2018. ^ Bologov, Petr (27 February 2017). "The bridge-long dream". intersectionproject.eu. Retrieved 1 July 2017. ^ "История строительства и разрушения моста через Керченский пролив". www.rzd-expo.ru. Retrieved 16 May 2018. ^ Проект для моря. Vokrug sveta (in Russian). 1 December 1972. Retrieved 19 February 2016. ^ На стыке двух морей (33-36 pages). Tekhnika Molodezhi (in Russian). January 1985. Retrieved 19 February 2016. ^ a b Лужков присоединяет Крым к России. Kommersant (in Russian). 8 April 1999. Retrieved 25 April 2009. ^ "Russia green lights road and rail bridge to Crimea". RT. 19 March 2014. Retrieved 22 March 2014. ^ "Russia to Build Bridge to Crimea". RIA Novosti. 19 March 2014. Retrieved 22 March 2014. 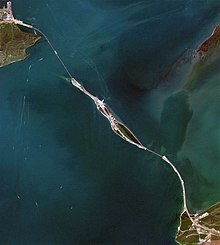 ^ "Kerch Strait bridge to be built ahead of schedule — deputy minister". ITAR-TASS. 19 March 2014. Retrieved 22 March 2014. ^ "Ukraine withdraws from Kerch Strait bridge project with Russia". ITAR-TASS. 1 October 2014. Retrieved 1 October 2014. ^ "Russia's controversial Crimea bridge gets giant arch". British Broadcasting Corporation. 28 August 2017. Archived from the original on 17 November 2017. Retrieved 17 November 2017. ^ "Ukraine conflict: Putin ally to build bridge to Crimea". BBC News. 30 January 2015. Retrieved 30 January 2015. ^ "Ukrainian MP suggests destroying Crimean Bridge". eadaily.com. 22 May 2018. ^ "Diplomat sees Ukrainian lawmaker's call to destroy Crimean Bridge as inciting terrorism". TASS. 11 December 2018. ^ "Ukraine-Russia clash: MPs back martial law". BBC News. 27 November 2018. Retrieved 27 November 2018. ^ "Russian Railways Head: Kerch Strait Bridge Can be Adapted for High-Speed Trains". Sputniknews.com. Retrieved 13 December 2017. ^ "Russian bridge to Crimea going up at lightning speed (PHOTO, VIDEO)". Rt.com. Retrieved 13 December 2017. ^ "200 бомб найдено в районе строительства моста через Керченский пролив". tvzvezda.ru. Retrieved 13 December 2017. ^ "Три временных моста построят для доставки материалов на строительство Керченского перехода". Tass.ru. Retrieved 13 December 2017. ^ "Завершено строительство первого рабочего моста в Керченском проливе". Kp.ru. 1 October 2015. Retrieved 13 December 2017. ^ "Russia installs Crimea bridge railway arch in unique operation (VIDEO)". RT. 28 August 2017. Retrieved 28 August 2017. ^ "Drone footage captures 2nd roadway arch of Crimean Bridge mounted in place". Rt.com. 14 October 2017. Retrieved 15 October 2017. ^ "Russia's National Guard to form maritime brigade". TASS. 25 October 2017. Retrieved 26 August 2017. ^ "Putin drives Kamaz truck across newly-opened Crimean bridge (VIDEO)". RT. 15 May 2018. Retrieved 15 May 2018. ^ "Строители подняли съехавший в воду пролет Крымского моста" [Builders raise the span of the Crimean bridge that fell into the water]. Interfax.ru (in Russian). 24 October 2018. Retrieved 24 October 2018. ^ "Строительство Керченского моста вышло на пиковую мощность". ТАСС (in Russian). Retrieved 9 August 2017. ^ "Средняя зарплата по областям Украины : январь 2014" (in Russian). index.minfin.com.ua. Retrieved 1 October 2017. ^ "Социально-экономическое развитие Республики Крым и г. Севастополя до 2020 года" (PDF). ^ a b "В Крыму уверены, что Крымский мост добавит полуострову 4 млн туристов". РИА Крым (in Russian). 23 December 2016. Retrieved 30 July 2017. ^ a b "Путин: Крым ждет экономическое возрождение путем проектов в судостроении, судоремонте, сельском хозяйстве, туризме". www.nakanune.ru. Retrieved 1 October 2017. ^ "Около 5,6 млн туристов посетили Крым в 2016 году". ТАСС (in Russian). Retrieved 1 October 2017. ^ "Russian bridge to Crimea sets new traffic record as tourists pour in". RT International. Retrieved 9 August 2018. ^ "Крымские сельхозпроизводители экспортировали полмиллиона тонн зерна и более 30 тыс тонн кориандра". www.c-inform.info. ^ "Эксперты: развитие крымского виноделия потребует изменения федеральных законов". ТАСС (in Russian). Retrieved 4 November 2017. ^ Ведомости (21 March 2017). "Как "Крымский титан" перестроился на работу в России". Retrieved 19 August 2017. ^ "В Крыму построят железную дорогу в обход Украины ради запуска стратегического завода". ТАСС (in Russian). Retrieved 1 October 2017. ^ Тычинская, Галина (5 April 2016). "Судостроение в Крыму: От яхт до крейсеров ВМФ". Правда.Ру (in Russian). Retrieved 1 October 2017. ^ "BSNews :: "Черный список" судов, заходивших в Крым за время оккупации – база данных". BSNews (in Russian). Retrieved 14 May 2018. ^ "Зерновые терминалы Крыма простаивают". Agroinvestor.ru (in Russian). Retrieved 14 May 2018. ^ "В Керчь пришла реконструкция" (in Russian). portnews.ru. Retrieved 14 May 2018. ^ "Главгосэкспертиза одобрила проект реконструкции порта крымской Евпатории". ТАСС (in Russian). Retrieved 14 May 2018. ^ "Морские "Кометы" Ялта-Севастополь начнут курсировать в июне". Российская газета (in Russian). 14 February 2018. Retrieved 14 May 2018. MacFarquhar, Neil; Nechepurenko, Ivan (11 November 2017). "Putin's Bridge to Crimea May Carry More Symbolism Than Traffic". The New York Times. ISSN 0362-4331. Wikimedia Commons has media related to Crimean Bridge.